Hard Drive Data Recovery | SATA, IDE, EIDE, SCSI SSD Hard Recovery. Whether its business or personal data loss, we can help. Protech Data Recovery is the national leader in expert hard drive data recovery with over a 90% success rate. If we can’t recover your data… you don’t pay! With certified Class 10 ISO 4 Cleanroom technology and an extensive track record of success, Protech Data Recovery offers professional hard drive recovery. We specialize in all types of hard drive failure including clicking hard drives, read write issues, head crashes, electronic damage and more. Protech Data Recovery is the national leader in expert hard drive data recovery with over a 90% success rate. If we can’t recover your data… you don’t pay! With certified Class 10 ISO 4 Cleanroom technology and an extensive track record of success, Protech Data Recovery offers professional hard drive recovery. We specialize in all types of hard drive failure including clicking hard drives, read write issues, head crashes, electronic damage and more. Solution for Hard Drive Data Recovery Services. In today’s era there is so much data everywhere. A lot of it is attributed to the fact that hardware has become a lot cheaper. New innovations in technology have also been instrumental in bringing this data boom. With this the risk of losing important data has also increased to a very large extent. Situations may arise when you accidentally delete some very important data. Well, not to worry anymore. Protech Data Recovery data services assist you in the best possible way to recover your data. We take care of all versions of the Windows operating system. So irrespective of the OS you can look forward to us for any trouble caused by loss of data from your hard disk as we provide the finest hard drive data recovery services. Our hard drive data recovery is not only limited to Windows but also DOS, Linux, MAC and many more. We also extend our hard drive data recovery services to a variety of hard disk drives available today which are SATA, IDE, EIDE and others. The physical damage to the hard drive is caused by a number of reasons. Some of these are mechanical or electrical failure, hard drive with burned chips, hard drives which the BIOS cannot identify and others. The point to be noted here is that there can be non-physical damage as well to the hard disk which can be due to virus attacks, corrupt partition tables, formatted drives etc. We have trained engineers who can identify the exact issue and work on it which is the reason for the efficiency of Protech Data Recovery in hard drive file recovery services. There are some signals which the hard drive shows that you can utilize to find out whether it is going to face trouble. One of the most common ones is noise coming from the hard drive. One more sign is when you feel that the hard drive is spinning but is not detected by the BIOS. This is a tricky situation and if you are not really sure of the problem, it is better not to act. In such situations we are here to provide our guidance and help so that you don’t lose the valuable data. Sometimes it so happens that we try to back up the data using repair utilities or other recovery tools and end up doing more damage. Protech Data Recovery can help you avoid such a situation. Signs of future HDD failure can manifest in several ways. If your hard drive begins to display the following warning signs, you should prepare to backup or transfer data. Failure can be gradual but do not wait for the symptoms to worsen before taking action. One of the most common ones is system or data transfer is very slow. This is a tricky situation and if you are not really sure of the problem, it is better not to act. In such situations we are here to provide our guidance and help so that you don’t lose the valuable data. Sometimes it so happens that we try to back up the data using repair utilities or other recovery tools and end up doing more damage. Protech Data Recovery can help you avoid such a situation. Slowing data transfer rates – If your file transfer operations (copying or writing files) begin to slow down, hard drive failure is not guaranteed but it may be an early warning sign—it could be an issue related to failure or other hardware, such as RAM. However, if performance begins to noticeably slow and other symptoms pop up, then it may be wise to start backing up data. Corrupted data – Files that can’t open or go missing are another sign that your hard drive may be reaching end of life. Increasing number of bad sectors – A subsection of the physical disc on a hard driver platter or flash memory chip, a sector goes “bad” when it can no longer respond to read/write operations. It can be a result of physical damage or software errors. When the number of bad sectors increases, it can be a sign of future drive failure. If the bad sectors are a result of software issues, you can attempt a fix in Windows. It is highly recommended to do a full backup before attempting to run any software repair utilities. In doing so on a corrupt or failing drive can cause irreversible damage, thus making it impossible to recover data. Strange noises (HDD only) – Unlike SSDs, hard drives do not operate silently—they tap and whirr in normal operation. However, loud and irregular noises such as clicks and clacks serve as an indication of drive health. If you start hearing loud noises and notice degrading performance, failure is imminent. HDD Self-Monitoring, Analysis and Reporting Technology (S.M.A.R.T.) metrics – S.M.A.R.T. is a technology built-into hard drives and solid state drives that reports on several metrics used to determine overall health. For sudden drive failure, S.M.A.R.T. may not be the most useful tool, but it will help track gradually declining performance. To fetch your drive’s S.M.A.R.T. metrics, use a free tool such as SpeedFan. If you need further assistance or have any questions, Call Us 24/7 Toll Free at: (877) 967-3548. We will provide you with the best possible assistance. 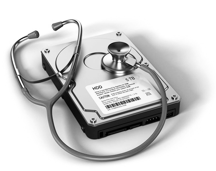 Get FREE Data Recovery Diagnosis for your hard drive now! Providing customers with the fast, secure, confidential, reliable, and most affordable hard drive data recovery services. Call us 24/7 (877) 247-6777.